In this fairly wide-ranging interview, Dale Pinkert has me tie in the bigger picture of how long-term cycles impact and reinforce what we’re seeing in the US markets, the EURUSD currency pair and the US Dollar. I touch on the work on Dr. Raymond Wheeler, Ph.D. and the undisputed GISP2 data that supports his work on climate from the 1940s-60s. Dale has over 30 years of trading experience specializing in commodity futures & currencies. He’s a former Member of The CME(IOM).His views and perspectives have been aired on the following Financial Television and Radio stations. CNBC (Market Mavens & Power Lunch), FNN (The Financial News Network) KWHY TV (The Business Channel Los Angeles) Channel 26 TV ( Chicago, Milwaukee) KMNY Radio (Southern California) KCEO radio (San Diego) KFNN radio (Phoenix). Find him at Forex Analytix. 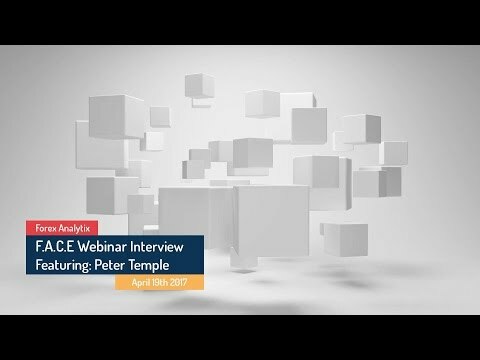 He does a weekly interview with markets experts from around the world. Well worth tuning in. Below you’ll find the chart that I refer to, along with links to some of my other videos that will provide some background to my assertions. Above is the civilization chart I created (featured in the video). The data comes from the National Oceanographic and Atmospheric Administration—from the Greenland Ice Core Research project ending in 1992. Ice cores are an extremely accurate method of determining temperature back through the centuries. This data is undisputed by the scientific community, but has been suppressed by the UN-associated man-made warming advocates. 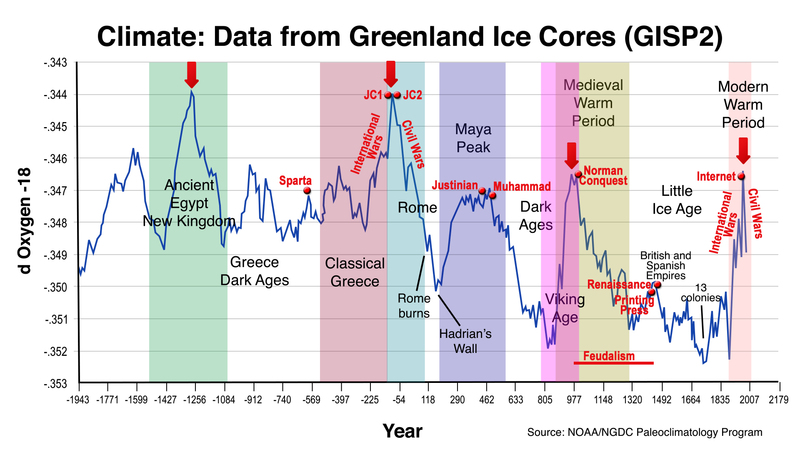 What the above chart shows it the temperature cycles over the past 4,000 years. Each time there’s a temperature peak, a major civilization also peaks and then goes into contraction. This has happened over and over again throughout recorded history. Certain world events take place at predictable points along this 1030 year cycle peak spectrum. “JC1” refers to Julius Caesar, “JC2” to Jesus Christ and the start of Christianity. Note that the Islamic religion also began at a climate peak, around 600 AD (Muhammad). History Rhymes. If you want to know the future, study the past. International wars take place as the temperature rises, civil wars as the world temperature cools. Here’s a video that explains in more detail how climate runs in cycles: Global Cooling. Here’s another video that shows how temperature parallels the movement of the stock market. Don’t Like the Climate? Wait a Cycle!